The text input problem type is a core problem type that can be added to any course. At a minimum, text input problems include a question or prompt and a response field for free form answer text. By adding hints, feedback, or both, you can give learners guidance and help when they work on a problem. In text input problems, learners enter text into a response field. The response can include numbers, letters, and special characters such as punctuation marks. Because the text that the learner enters must match the instructor’s specified answer exactly, including spelling and punctuation, edX recommends that you specify more than one correct answer for text input problems to allow for differences in capitalization and typographical errors. In the LMS, learners enter a value into a response field to complete a text input problem. An example of a completed text input problem follows. To add the example problem illustrated above, in Studio you use the simple editor to enter the following text and Markdown formatting. 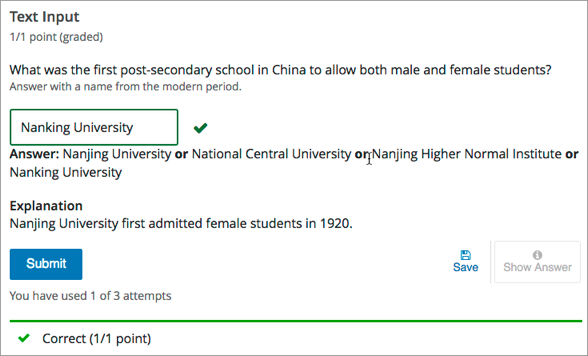 Nanjing University first admitted female students in 1920. The OLX (open learning XML) markup for this example text input problem follows. For the text input problems in your course, you can use edX Insights to review aggregated learner performance data and examine submitted answers. For more information, see Using edX Insights. You add text input problems in Studio by selecting the Problem component type and then using either the simple editor or the advanced editor to specify the prompt and the acceptable answer or answers. When you add a text input problem, you can choose one of these templates. You can use the advanced editor to identify the elements of a text input problem with OLX. For more information, see Text Input Problem XML Reference. You can specify more than one correct response for text input problems. For example, instead of requiring learners to enter an answer of “Dr. Martin Luther King, Junior” exactly, you can also allow answers of “Martin Luther King, Jr.” “Doctor Martin Luther King,” and other variations. To do this, you can use the simple editor or the advanced editor. To specify additional correct responses in the simple editor, include or= before each additional correct response. =Dr. Martin Luther King, Jr.
To specify an additional correct response in the advanced editor, within the <stringresponse> element add the <additional_answer /> element with an answer="" attribute value. For an overview of feedback in problems, see Adding Feedback and Hints to a Problem. In text input problems, you can provide feedback for the correct answer or for a specified incorrect answer. Use feedback on incorrect answers as an opportunity to address common learner misconceptions. Feedback for text input questions should also provide guidance to the learner on how to arrive at the correct answer. If you define multiple correct responses for the question, you can define feedback for each response. You can configure feedback in the simple editor. When you add a text input problem, select the template Text Input with Hints and Feedback. This template has example formatted feedback that you can replace with your own text. In the simple editor, you configure feedback for a text input problem with the following Markdown formatting. For example, the following problem has feedback for the correct answer and two common incorrect answers. In the advanced editor, you configure answer feedback with the following syntax. state in terms of land area, it is actually the second largest of the 50 U.S.
For example, the following feedback is configured to use custom labels. <correcthint label="Right you are">Alaska is the largest state in the U.S.
You can add hints to a text input problem using the simple editor or the advanced editor. For an overview of hints in problems, see Adding Feedback and Hints to a Problem. You might want to include a word, phrase, or sentence after the response field in a text input problem to help guide your learners or resolve ambiguity. To do this, you use the advanced editor. In the problem, locate the textline element. This element creates the response field for the problem and is a child of the stringresponse element. An example follows. To add text after the response field, add the trailing_text attribute together with the text that you want to use inside the textline element. By default, text input problems do not require a case sensitive response. You can change this default to require a case sensitive answer. To make a text input response case sensitive, you use the advanced editor. In the advanced editor, the stringresponse element has a type attribute. By default, the value for this attribute is set to ci, for “case insensitive”. An example follows. Learners who submit an answer of either “Paris” or “paris” are scored as correct. To make the response case sensitive, change the value of the type attribute to cs. Learners who submit an answer of “Paris” are scored as correct, but learners who submit an answer of “PARIS” are scored as incorrect. By default, the response field for text input problems is 20 characters long. You should preview the unit to ensure that the length of the response input field accommodates the correct answer, and provides extra space for possible incorrect answers. If the default response field is not long enough, you can change it using the advanced editor. In the advanced editor, the textline element has a size attribute. By default, the value for this attribute is set to 20. An example follows. To change the response field length, change the value of the size attribute. You can configure a text input problem to allow a regular expression as an answer. Allowing learners to answer with a regular expression can minimize the number of distinct correct responses that you need to define for the problem: if a learner responds with the correct answer formed as a plural instead of a singular noun, or a verb in the past tense instead of the present tense, the answer is marked as correct. In the advanced editor, the stringresponse element has a type attribute. You can set the value for this attribute to regexp, with or without also including ci or cs for a case insensitive or case sensitive answer. An example follows. The regular expression that the learner enters must contain, in whole or in part, the answer that you specify. In this example, learners who submit an answer of “string pattern”, “String Patterns”, “string patterned”, or “STRING PATTERNING” are all scored as correct, but learners who submit an answer of “Strings Pattern” or “string patern” are scored as incorrect. For text input problems, the <problem> element can include this hierarchy of child elements. Required. Indicates that the problem is a text input problem. Note that if you do not also add the type attribute and set it to regexp, the learner’s answer must match the value for this attribute exactly. Specifies whether the problem requires a case sensitive response and if it allows regular expressions. If type="ci", the problem is not case sensitive. If type="cs", the problem is case sensitive. If type="regexp", the problem allows regular expressions. You can also combine these values in a space separated list. For example, <stringresponse type="regexp cs"> specifies that the problem allows regular expressions and is case sensitive. Required. Creates a response field in the LMS where the learner enters a text string. size Optional. Specifies the size, in characters, of the response field in the LMS. Defaults to 20.
hidden Optional. If set to “true”, learners cannot see the response field. correct_answer Optional. Lists the correct answer to the problem. trailing_text Optional. Specifies text to appear immediately after the response field. Optional. Specifies an additional correct answer for the problem. A problem can contain an unlimited number of additional answers. answer Required. The text of the alternative correct answer. Optional. Specifies feedback to appear after the learner submits a correct answer. label Optional. The text of the custom feedback label. Optional. Specifies feedback to appear after the learner submits an incorrect answer. answer Required. The text of the incorrect answer. Optional. Identifies the explanation or solution for the problem, or for one of the questions in a problem that contains more than one question. The following example shows the XML format with the <hintgroup> element that you could use in the past to configure hints for text input problems. Problems using this XML format will continue to work in the edX Platform. However, edX recommends that you use the new way of configuring hints documented above.